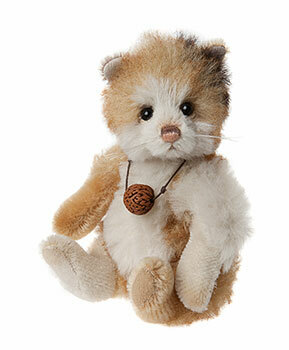 Charlie Bears Rocky Hampster Minimo Discounts Apply ! Designed by Isabelle Lee for Charlie Bears 2015 10th Anniversary Wildlife Minimo Collection. Rocky The Hampster is fully jointed and hand finished in Shades of White and Brown and Black Mohair and Alpaca (67% Alpaca & 33% Mohair ) has a Lovely nut Necklace around the neck. Made of the finest schulte Mohair and Alpaca, Hand stitch Nose a Bushy Tail and glass eyes made in the UK.